When it comes to storing controlled substances, in particular prescription drugs, the warehouse and bulk storage aspects are important for pharmaceutical, hospital central supply warehouses, or retail outlets. This is an area where many people who should not have access to medication may find easier opportunities for pilferage. The FDA offers some guidelines on how to operate securely, and within regulations. State licensing laws will typically reflect the minimum Federal requirements, but may exceed those, when it comes to the storage and handling of prescription drugs. Facilities should be of suitable size and construction. This means that your building has to be large enough for maintenance, cleanliness, and any specialized equipment needed to adequately store the load. When you’re considering the needed space for new expansion or to take on new SKU’s, consider what may be needed around those items. Will they require extra security? That takes space. Humidification or refrigeration? Monitoring? All of these facets should be included in your thought process as you move forward. The facility should provide adequate lighting, ventilation, and sanitation, and security. You’ll need a separate quarantine area for outdated drugs, returns, damaged packaging, mishandled, or mis-branded products. The size of this area will depend on your overall operation. It should be clearly marked, and access to it controlled. If the immediate or sealed outer or sealed secondary containers have been opened or used, quarantine them until they are either destroyed or returned to the supplier. The FDA is a stickler for cleanliness. This is a good idea in any storage operation, but moreso in a controlled or prescription substance one. Make sure your pallet racks are installed with “rat runs” (enough space for traps to be placed) against walls. Same goes for case flow racking, conveyors, and other storage equipment. Bug blocking doors or other technology that helps reduce infestations are particularly important in these operations. Security is an obvious and overriding issue. The FDA is clear that entry from the outside should be secure from unauthorized parties. The default assumption here is that you’re protecting your storage area from burglars, but you may want to consider the entrance of others, such as truck drivers, salespeople, and other visitors. Are they adequately controlled within your facility? We have some suggestions on overall access control here, and also recommend utilizing “man trap” driver security cages to control your doors. As the FDA says, “Entry into areas where prescription drugs are held shall be limited to authorized personnel.” Utilize DEA approved security cages to limit access in warehouse operations. 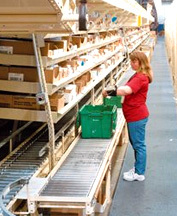 Also consider utilizing pallet rack security caging, which can help secure particularly sensitive rack bays for you. You’ll want a well-lit exterior. Make sure the lights are working, and checked regularly. You must have a working alarm system. Interestingly, the FDA talks directly about “diversion”. This is theft at the dock, usually with truck drivers and warehouse personnel working together. They want you to examine incoming shipments for quality, so that those drugs that are “unfit for consumption” aren’t distributed. This can also help with pilferage issues. Read the FDA regulations here. This is a summary of the storage and security issues, but there are many other aspects to compliance.